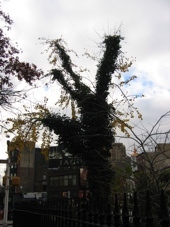 This is a ginkgo tree in Sheridan Square (in the Village). They’re my favorite tree because they look so science fiction-y. Oh God, I just read this. “Extreme examples of the Ginkgo’s tenacity may be seen in Hiroshima, Japan, where four trees growing between 1-2 km from the 1945 atom bomb explosion were among the few living things in the area to survive the blast.” I also just read that they’re still alive today! None of the ginkgos around the world seem to grow as weirdly as ours in New York City, though. Anyway, I was on the Long Island Railroad at 7:37AM this morning, God help me, to go out to interview the people from the Property Section of the SCPD in Yaphank. They were all extremely nice to me, and showed me the gun that Ronnie DeFeo used to kill his family (of Amityville Horror house fame).